Our heal th and wellness are two of the most important “possessions” we have. Yet as writers, sometimes we take them for granted. If we’re too engrossed in our work and lose track of time, or a crucial deadline on a blog post or a round of rewrites is looming, we might feel tempted to ignore sleep, hunger, and other needs. Here’s what I can tell you from personal experience: It’s not worth it. In fact, it’s essential for us to step away from our craft now and then so we can take care of ourselves. And by remembering to balance creativity with self-care, we can be productive, happy, and healthy. 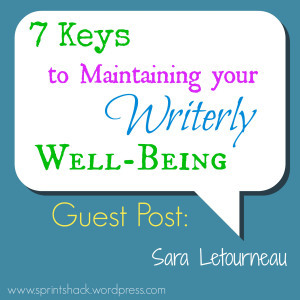 So, how can you maintain your well-being without sacrificing too much of your writing? Here are seven keys that focus on all-around areas of physical, emotional, and mental wellness. ← The Thank-You Giveaway Extravaganza!